Thanks to several sources, we now know of this area that operated at the Northfield Inn. The ski area had a few rope tows, toboggan slides, ski shop, ski rentals, instruction. According to the Ski Guide to the Pilgrim State from Betsy McDonough, the area was located on Rte 10 and 63 in East Northfield. The area closed sometime in the 1970's, and the inn has been torn down today. Here's a view of the rope tow on what appears to be a gentle slope. Thanks to Jeffrey L. Goller, we have this topo map of this ski area. Here are his details: To the left is a USGS map of the area I learned to ski on. It was run by the Northfield School for girls in the 50’s, 60’s, and 70’s. 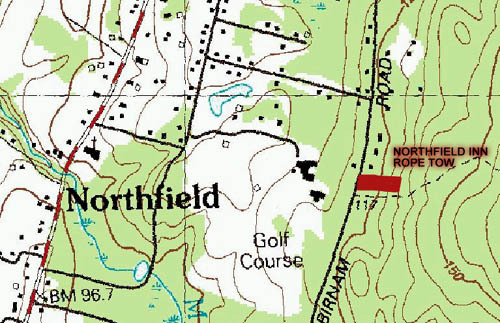 It was Located on Birnam Road just north from the Northfield Inn Golf Course which is now called the Northfield Golf Course. It had a rope tow and is was about 400 feet long. 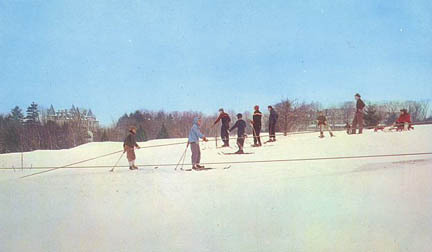 The property is still owned by Northfield Mount Hermon School, the name of the school now that the Northfield School for girls and the Mount Hermon School for boys married in 1970.
and the Northfield Inn, owned and run by the schools' administration, unfortunately now longer in existence. I believe there was a rope tow on the hotel-owned golf course which operated in the 1950's and 1960's, when I returned there for vacations with my family. My memory is particularly clear about the area because a friend we brought along on one trip broke her leg skiing on a beginner's slope at the Inn. We also have info from Bill Schweiker that we hope to have up here soon.